A lot has been said recently about the 100 year anniversary of the first women getting the vote. In that context this month’s photo is interesting. 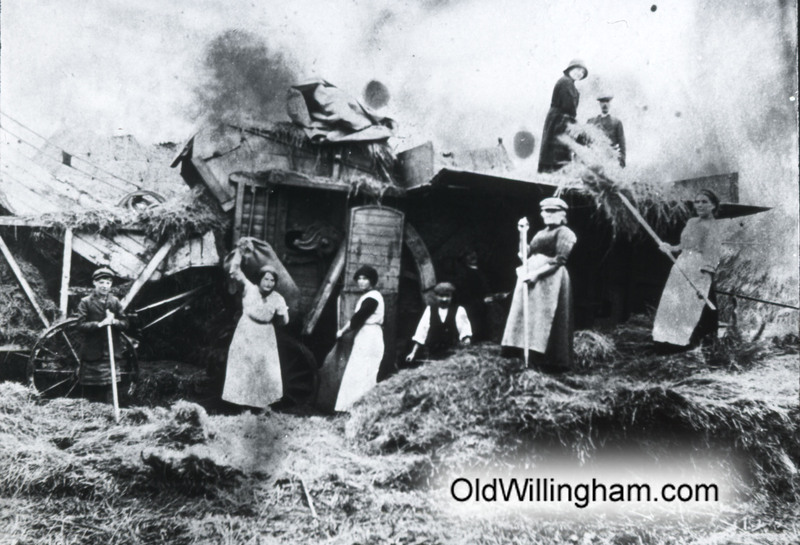 The scene is the noise and bustle of a threshing machine separating the wheat from the stalks. The cut wheat is put in the hopper on the right and the stalks come out on the left minus the wheat grains which are collected in sacks underneath. What is interesting is that most of the workers are women including one carrying out the large sack. We don’t know the date of this photo but it may well be in WW1 when many men were away fighting. It was the integration of women into the workforce that was a factor in changing their role in society and winning them the right to vote.